Maybe it’s my childhood speaking but there is nothing better on a weeknight than a hearty bowl of pasta. Growing up, it was usually marinara that had been simmering on the stove all day or a simple meat sauce but as an adult, I like to shake things up. Sun-dried tomatoes are one of my favorite ingredients to incorporate into pastas. The Cheesecake Factory used to have a pasta dish with sun-dried tomatoes and chicken that I would go ga-ga over. That was my first experience with the tasty little things. This recipe is sort of inspired by that dish but much simpler. To craft this sauce, you want to follow the same steps you would to make a basic gravy. Start with butter, olive oil, onions and garlic to get the flavor profile going. Add in the flour for a thickening agent and whisk in chicken stock. You could also use veggie stock to keep this vegetarian but I find chicken or turkey have the mildest flavors as stocks and you don’t want the stock flavor to overpower the rest of the dish. Let the stock simmer for a bit letting it thicken to a nice consistency. Add your heavy cream and tomato paste and whisk to avoid clumping. This is what’s going to give the dish a nice richness and robust flavor. The more tomato paste you add, the brighter in color it will be and the heavier in tomato flavor you will get. As you can see, mine is a tad orange but the flavor was exactly where I wanted it. Finally, mix in the tomatoes and let the whole mixture simmer a little longer. This will allow the sauce to thicken a smidge more while the tomatoes soften a bit and release their beautiful flavor. Let’s talk pasta. There are hundreds of different cuts of pasta. It’s mind blowing when you look into it. For a creamy sauce without a lot of solid ingredients, I like to use a pasta that will grab onto the liquid. 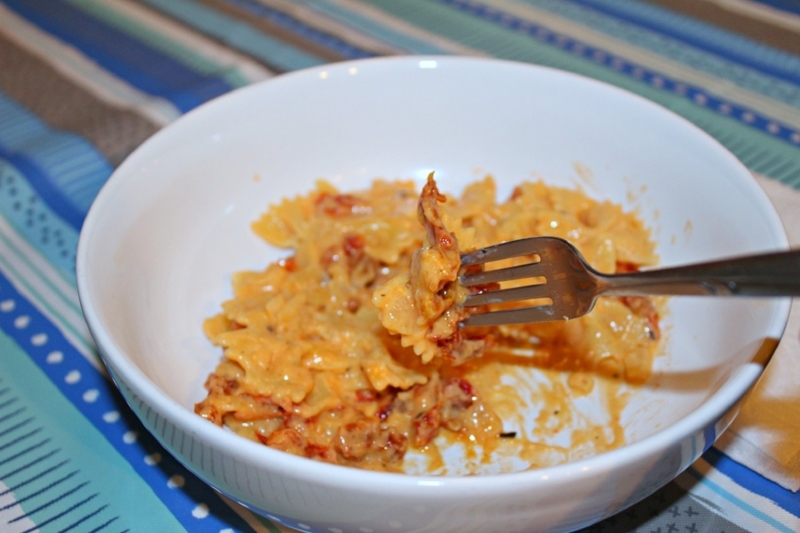 Bowtie Pasta, or Farfalle, is a great option for this. Fusilli, Cavatappi, Cellentani, Gemelli, Campanelle, Gigli or Rotini are also good cuts. Look for a pasta that has crevices. Those are what catch the sauce in the pasta. Of course, if you have a family favorite that is always stocked in the pantry, by all means use that instead. The previous recommendations are cuts that I prefer myself for this type of sauce but at the end of the day, it’s all pasta and it’s going to taste incredible. 1 - Bring a pot of water to a boil. Salt the water and add the pasta. Cook to al dente. 2 - In a deep frying pan, melt the butter with olive oil over medium heat. Add the onions and garlic and cook until softened but not browned, about 4-5 minutes. Add the flour a little at a time stirring to make sure it doesn’t clump. Slowly whisk in the chicken stock. Bring to a boil and let simmer about 4-5 minutes to thicken. 3 - Whisk in the heavy cream followed by the tomato paste. Whisk to avoid any clumps. Add the tomatoes in and stir to spread throughout the sauce. Let simmer for five minutes allowing the liquid to heat through and thicken and the tomatoes to warm as well. Add salt and pepper to paste. Toss with the pasta and serve.